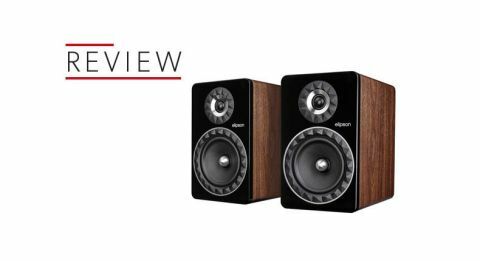 Elipson Prestige Facet 8B review | What Hi-Fi? As is obvious from the star rating at the top of this review, we’re a little disappointed with Elipson’s Prestige Facet 8Bs. While there’s nothing fundamentally wrong with these standmounters, they are hampered by sonic shortcomings that mar what appears, on paper at least, to be a strong proposition. Not that we know any of this when we first take the Elipsons from their packaging and admire them. These are relatively big speakers for the money, and each cabinet packs a chunky 17cm mid/bass unit. The combination of generous cabinet volume and sizable mid/bass driver promises deep bass, plenty of authority - and quite possibly strong dynamics too. The 36cm high cabinet is almost as deep as it is tall. It’s a nicely made MDF box, with rounded edges and a contrasting, lacquer-covered front panel. There are three standard finishes: black, white or walnut. The distinctively patterned rubber rings around the drivers aren’t just there for show – they’re shaped to help dispersion and reduce baffle effects. Around the back, you’ll find the usual set of biwire terminals and a rear-firing port. A conventional 25mm soft dome tweeter completes the driver array. While there’s nothing obviously unusual about the engineering behind either the high frequency or mid/bass unit – bar, possibly, the prominent phase plug at the centre of the larger driver – Elipson has managed to squeeze a relatively high sensitivity of 91dB/W/m out of the Facet 8B design. That high sensitivity means we get plenty of volume from the Rega Brio’s 50W per channel power output. We also use our reference system’s Gamut D3i/D200i pre/power combination to push the Elipsons harder, both in terms of power and transparency. Sources include Naim’s NDS/555PS music streamer, Clearaudio’s Concept MM turntable and Marantz’s CD6006 UK Edition CD player. We place the Elipsons on some Custom Design FS104 Signature stands, a little way into the room. This gives us reasonably balanced tonality, combined with a good stereo spread. Our first impressions of the 8Bs are positive. The authority suggested by the large cabinet and mid/bass unit materialises - the speakers deliver large-scale classical pieces such as Tchaikovsky’s Swan Lake with substance. There’s a good amount of low-end heft, but also a pleasing amount of fluidity through the higher frequencies. These are smooth speakers. There isn’t a trace of harshness when the music becomes difficult. Everything stays listenable and undemanding. That’s great if you have a collection of poorly recorded music or use low-resolution music files but, as we try different genres of music, doubts creep in. Listening to Kendrick Lamar’s To Pimp a Butterfly set, we find that the 8Bs’ easy-going nature starts to count against them. They fail to capture the drive and aggression of the recording. These standmounters just aren’t particularly dynamic or detailed - and low bass, while strong, isn’t taut. Where the best of the Elipson’s rivals are able to lay a recording bare, uncovering subtle instrumental strands and acoustic clues in the process, these mash the different elements together, sounding congested and confused by comparison. While the Elipsons never turn aggressive, they don’t excite that much either. Rhythms aren’t delivered with a great deal of enthusiasm or precision. Songs like Radiohead’s 15 Step are packed with verve and momentum, but through the 8Bs much of this is lost. We're left unmoved. There are cheaper alternatives that tell us more about the recording and communicate the music’s message with greater conviction - alternatives such as Q Acoustics Concept 20s. Refinement and authority can only go so far without detail, dynamics and rhythmic precision to back them up. The 8Bs are hard to get enthused about. They have a limited range of talents - some will find those talents appealing, certainly. But up against the class leaders – KEF’s Q350 and the Dynaudio Emit M10 in particular – they’re short of the all-round ability required to merit serious consideration.